Matthew Dalton in action for PAC. The Southern League is sponsored by Sweatshop and that’s exactly what the Division Three match at Colchester turned out to be for Matthew Dalton. 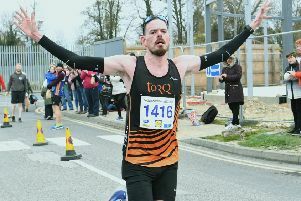 The Peterborough Athletic Club chairman took part in no less than seven individual events and he came up trumps in three of them. The 35 year-old all-rounder won the 110m hurdles A race, the 400m hurdles A race, the B string high jump and the B string triple jump, and also took part in the pole vault, long jump, shot, discus, hammer and javelin. And his decathlon helped Peterboroughfinish in second place behind the host club with an impressive tally of 292 points. Dalton also came second in the men’s match award stakes with his 400m hurdles win in 60.0 seconds. Jamie Horne was fourth in the match award points table with his winning leap of 1.80m in the high jump and Vytautas Chrapacas fifth with his 11.98m in the triple jump. Chrapacas completed an A string double by winning the long jump as well with 5.90m. Best event for the ladies turned out to be the 1500m steeplechase where PAC won maximum points through Sarah Caskey (A race winner) and Fatima Painda (B race winner). Match result: 1 Colchester & Tendring 313pts; 2 Peterborough AC 292pts; 3 3 Newham & Essex Beagles 267pts; 4 Loughton 182pts; 5 Ilford 131pts. 800m A: Amittai Ben-Israel 2:06.9. 1500m B: Andrew Suter 4:26.4. 110m hurdles A: Matthew Dalton 20.9. 400m hurdles A: Matthew Dalton 60.0. High Jump A: Jamie Horne 1.80. High Jump B: Matthew Dalton 1.45. Long Jump A: Vytautas Chrapacas 5.90. Triple Jump A: Vytautas Chrapacas 11.98. 800m B: Wendy Perkins 2:39.6. 1500m steeplechase A: Sarah Caskey 6:21.9. 1500m steeplechase B: Fatima Painda 7:02.2. High Jump B: Jamelia Smith 1.50. Long Jump B: Nichola Gibson 3.55. Javelin B: Stacy McGivern 18.30.